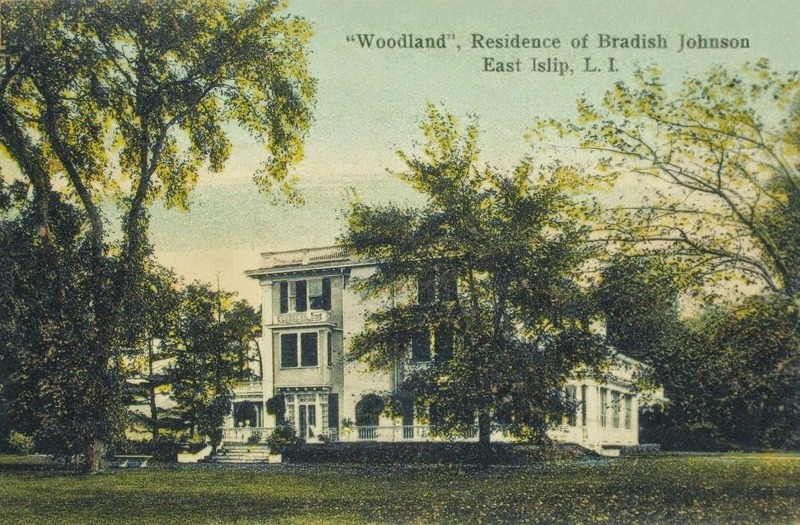 'Woodland', the Bradish Johnson Jr. estate designed by Isaac Henry Green II c. 1909 in Islip. Johnson, a financier and member of Bradish Johnson & Co., originally purchased a house called 'Woodland' which sat on the site and subsequently burned in 1905. 'Woodland' was inherited by Johnson's son Aymar and in 1946 the house was sold to the Hewlett School of East Islip and later in 2006 to a developer who subdivided the property. Click HERE to see 'Woodland' on bing. The good news is the developer did not tear down the house & it appears to be in reasonable shape. Zach, any indication how much land will be left around 'Woodland'? I ask this question almost every time I see a post of a house in the Islip-Bayshore area: it boasts among the most beautiful topography on Long Island and in its hay day seems to have been as sought after a resort area as "the Hamptons" or the fancier areas of the North Shore. I have never received a fully satisfactory answer to why it fell so rapidly and irredeemably off the map of society "hot spots". I agree Magnus...same with Oakdale and Sayville. A complete mystery. Can anyone tell if this house is made of stone or wood. In the 1930s Mrs. Aymar Johnson (Marian K. Hoffman), bought "Armsea Hall" estate in Newport for $14,000. After several subsequent ownerships the mansion was demolished in 1970. Located just west of "Hammersmith Farm" it shows up in an aerial photo taken by Robert Y. Richie. But Newporter- to my point- Newport, like every other resort during the period suffered through several decades of decline in which many large houses sold for next to nothing, stood empty or were demolished, and the fate of those that remained was in question. But, like Newport, pretty much every one of those areas soldiered on and even at their lowest ebb were still considered "society" destinations, if a bit moth eaten at the edges. The resorts along the Great South Bay (Islip-Bayshore-Sayville, Oakdale, etc.) seem to have completely lost their social cachet in the 1930's, never to have it revived. It strikes me as odd, especially for an area with such great intrinsic natural beauty. another theory: except for the areas south of Montauk Highway, there were no large tracks of land which could be assembled to build the kinds of estates which, by that time, were quite prevalent on the North Shore. Ownership on the South Shore appeared to be more fragmented as farming never did take hold in the pine barrens north of Montauk Hgwy or the thin topsoil btw Montauk Hghwy and the bays which would have allowed for large tracks of land which could be acquired and redeveloped as in Westbury, etc. I know that I am repeating myself, but the fate of Jay and Mary Carlisle's East Islip property Rosemary has long haunted me and seems so emblematic of the entire area's fall from social grace: it was one of the South Shore's nicest properties centered by a very large, but not hugely unmanagable house built in the late teens or early 1920's. It was truly a showplace and the Carlisle's lavished a great deal of attention on it, extensive landscaping on the grounds continuing through the 1920's. The Carlisle's both died within 8 months of each other in 1938, and their three sons seem not to have even made an attempt to offer the place for sale, instead flogging the contents at Parke Bernet's first US sale and tearing the house down, 20 years or so after it had been built. It seems like a fairly definitive statement about the bleak future the heirs saw for the area. Having spent a lifetime on LI, I will say that they single most destructive force affecting all of these homes, then and now, was zoning. By the 1930, virtually all of the north shore was organized into villages which retained zoning authority. Very little of the south shore was so organized, and zoning authority was in the hands of the Townships. Just look at what that wrought in Islip and Babylon Towns. By the late 40s the entire towns were carved up in 60'x100' plots. I think the handwriting was on the wall long before that. Don't the Havemeyer's still retain what might be, the last of the South Shore estates,(even though I understand the original Cotswold house torn down). And again, can anyone make out the material that "Woodland" is made of? My 2 cents. When William Levitt planned his mega communities he specifically looked for large acreage, flat land with minimal excavation and tree removal. He hit pay dirt with Long Island's vast flat interiors including most of the South Shore. The North Shore would have been a burden to carve up and move hillsdies to plot out homes and roads with timy plots while the south shore was an easy target to develop. I think the decline started before Levitt. Maybe it had something to do with the railroad extending east and south more along the south shore then the north. That has always been my belief -- extending the LIRR out to the somewhat failed development of Montauk simply placed too much economic pressure on the land surrounding it. Accessibility, favorable zoning and pressure to expand rang the death knell, IMHO. as a 1949 graduate of the Hewlett School (for Girls), I recall that "Woodland" was predominently constructed of white stucco. The interior had marvelous moldings, woodwork, and other custom traditional appointments of the day, sweeping stairways, large rooms, high ceilings, thick walls (! ), lovely bathrooms. A truly beautiful waterfront house that, I am thrilled to hear, still stands! I attended The Hewlett School from 1964-1968. At that time the estate was still complete. Woodland ( which was what our year book was named) or the Main House, where we took our meals and where boarding students lived, from what I remember, the exterior was like a stucco-cement. So I'm assuming the frame was of wood. The house still had the grand staircase, drawing room complete with grand piano and chandeliers. It was a beautiful place. Lessons were conducted in Frederick Hall which was originally the carriage house and stables converted to classrooms with a newer addition of two more classrooms with basement at one end. Sad to think that it's pieced out and torn apart.